Yesterday, Marquette County Republican Party secretary and former Chair Dan Adamini thought it would be hilarious to call for “another Kent state” to quell a protest that occurred on the campus of UC Berkeley where Breitbart writer and senior editor Milo Yiannopoulous was scheduled to speak. I’m completely baffled as to what “Portage acacian” references. If you know what this means, please let me know. Turns out “Portage acacian” means “poor education” according to Adamini. The statements made yesterday on social media by Dan Adamini are sickening, inhuman, and indefensible. 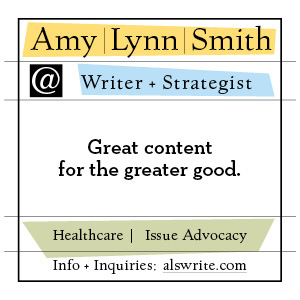 There is no ambiguity or alternative interpretation. 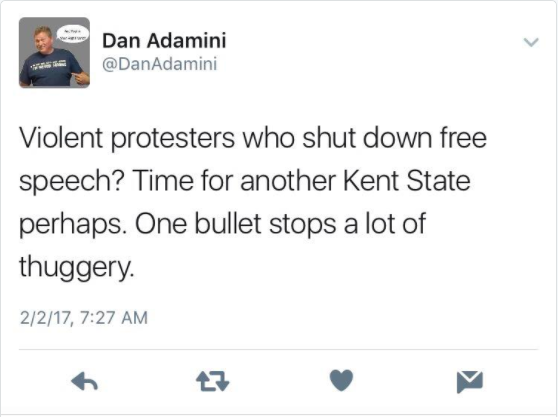 To call for “another Kent State” and declare that “one bullet stops a lot of thuggery” is to clearly and openly advocate for the murder of unarmed college students, simply because they don’t share his beliefs or point of view. Mr. Adamini should immediately apologize and then resign from any public or political party positions he holds. His words should be condemned and any association with him disavowed. The right to free speech is the cornerstone of our democracy, and when someone threatens another individual or group with harm for exercising it, that one person is a threat to all of us, as Americans. John Lewis: 'I don't see Trump as a legitimate president': https://t.co/h5I1BNitWK via @AOL. Too many blows to the Head during protests? This man is disgusting. He thinks because he’s in rural Northern Michigan he can get away for calling for shooting protesting students and smearing a civil rights hero and icon. He probably also feels that he doesn’t have to be “politically correct” anymore with Donald Trump as president. The fact is that he is NOT getting away with it and he’s getting exactly the sort of grief for it that he deserves. It’ll be interesting to see how the Marquette County Republican Party responds to this call for the murder of protesting students. Given that County Party Chair Brendan Biolo thinks Facebook should be “outlawed”, I can’t begin to imagine what he will do. 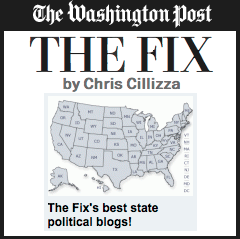 If I were in charge of the Michigan Republican Party, I would relieve Adamini of his leadership position and revoke his membership in the MRP. But, then again, I have strong American values and a firm moral compass. We’ll be watching the MRP to see if they do, as well. The statements made by Mr. Dan Adamini are highly irresponsible as a leader in the community, current officer, and former chair of the Marquette County Republican Party. To insinuate another Kent State Massacre needs to take place in this country to quell protests is disgusting and inhumane. 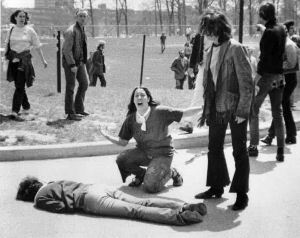 I remind all of you that the Kent State Massacre took the lives of 4 people, injured 9 others, and resulted in 1 person suffering paralysis. No person has ever been brought to justice for these murders. The statements made by Mr. Dan Adamini were clear after checking both of his social media accounts (Facebook and Twitter). It’s with profound sorrow that I believe he meant what he said. The Marquette County Democratic Party encourages and participates in PEACEFUL protests across the region and believes that it is our 1st Amendment right. I do not believe violence is ever the answer and should never be a solution to any peaceful protest or problem. I hope that with some deep introspection and prayer that Mr. Dan Adamini will realize the faults in his words and thoughts and accept LOVE into his heart.